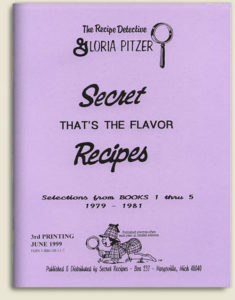 1990 – Gloria Pitzer’s Secret Recipes of Famous Favorites was written, illustrated and published by Gloria Pitzer (Secret Recipes, St. Clair, MI). NO LONGER IN PRINT – this cookbook has a 120-page, 5.5” x 8.5” format filled with over 400 recipes from the original “Books 1-5” series, established in 1976-1982. 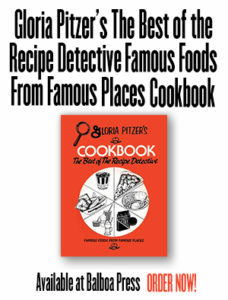 However, this collection was not reprinted in any of the other books Gloria has written since that 5-book series. Included in this collection, you’ll find everything from “After Dinner Mints” to “Zucchini Bread”. 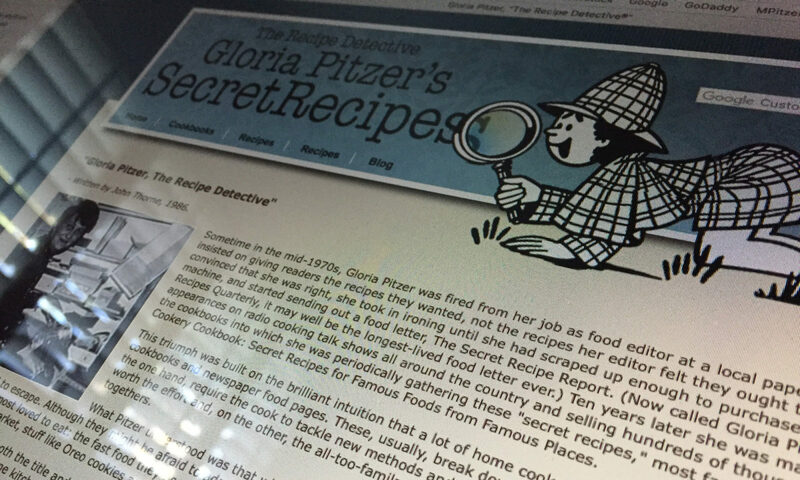 Famous make-alike versions of “Arby’s-Style Cheesecake”, “Buddy’s-Style Pizza”, “Frankenmuth Gingerbread”, “Paul Newman-Style Dressing”, “Stuckey’s-Style Pecan Brownies” and even a recipe from the White House; given to Gloria from Betty Ford, herself! 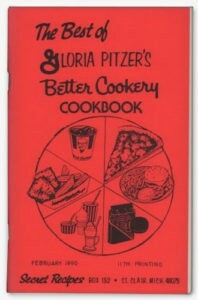 1995 – Gloria Pitzer Presents The Best of the Better Cookery Cookbook was revised again. 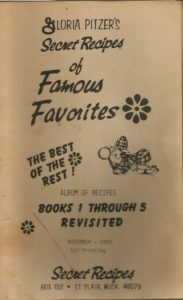 It’s called the “16th printing”; but is, actually the first printing titled this way, which could also be considered the 6th printing of “The Best of” version. This limited edition cookbook used the 8.5” x 11” format – with the 120 pages of the smaller format laid out sideways on 60 larger pages, showing 2 pages of the old layout on each page, with more than 400 recipes still listed, including some new additions. 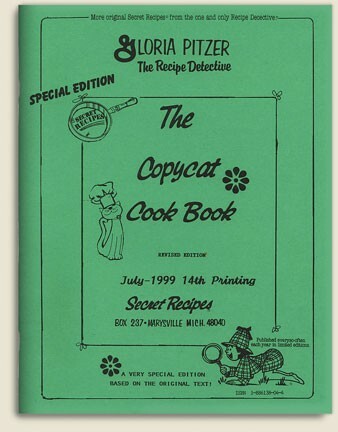 Copies sold for $7.50 each. 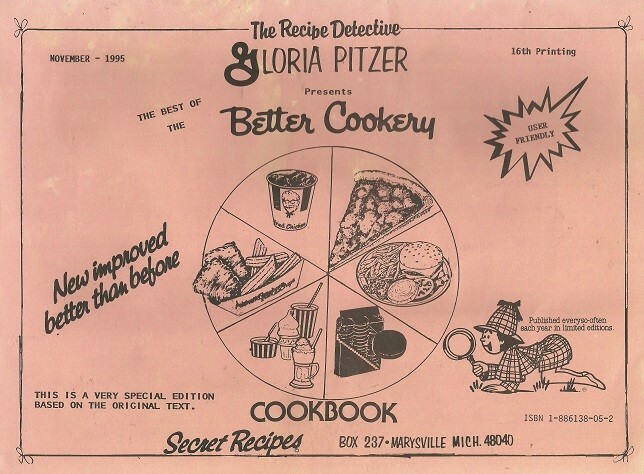 1990 – THE BEST OF Gloria Pitzer’s Better Cookery Cookbook was written, illustrated and published by Gloria Pitzer (Secret Recipes, St. Clair, MI). NO LONGER IN PRINT – this cookbook is an updated & revised version of the original, 1982-1988 editions of The Better Cookery Cookbook. 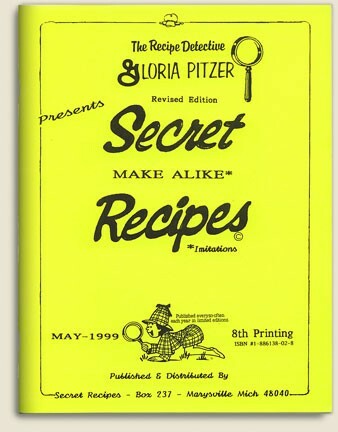 Shown above, this revised edition says it’s the “11th printing”; however, technically, the “11th Printing” is actually the “1st Printing” of THE BEST OF Gloria Pitzer’s Better Cookery Cookbook, which is a revised collection of the most popular and most favorite recipes from the original collection, condensed into a 120-page, 5.5” x 8.5” format from the original, larger and more detailed book from the 80’s format. 1989 – Gloria Pitzer’s My Cup Runneth Over – And I Can’t Find My Mop was written, illustrated and published by Gloria Pitzer (Secret Recipes, St. Clair, MI). 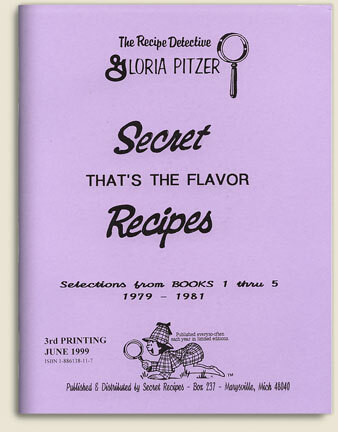 NO LONGER IN PRINT – this limited edition book has a 120-page, 5.5″ x 8.5″ format and is a culmination of the Pitzer family and how they got into the merry – sometimes mad – world of Secret Recipes, with a few special recipes thrown into the mix. 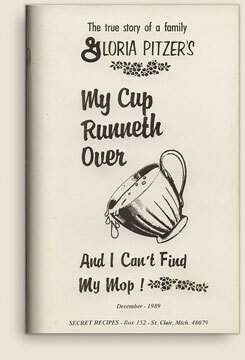 This book is full of food-for-thought and witty stories of the trials and tribulations of a kitchen table, family enterprise . 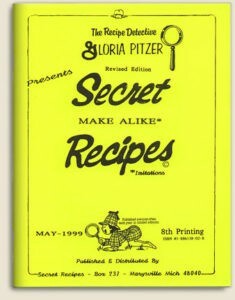 1986 – Gloria Pitzer’s Mostly 4 Ingredient Recipes – was written, illustrated and published by Gloria Pitzer (Secret Recipes, St. Clair, MI). NO LONGER IN PRINT – this cookbook has a 120-page, 5.5″ x 8.5″ format, boasting about 470 recipe listings in its index of her radio-listeners’ favorite dishes – ones that Gloria developed and tested to perfection. 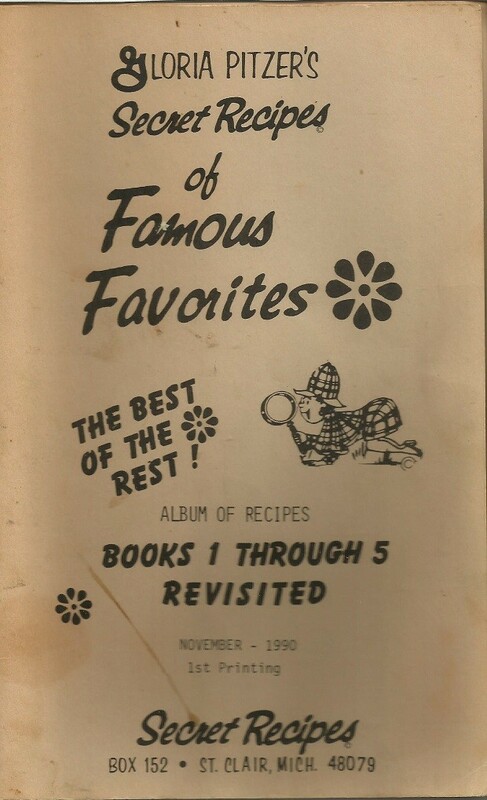 This cookbook includes all of her favorite shortcuts to success that have been popularly requested by her radio-listeners, during her visits with over 150 radio stations around the world. 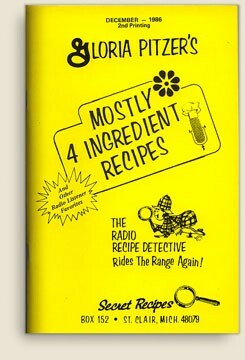 After Paul and Gloria became “empty-nesters”, this book came in handy for cooking just for two again! 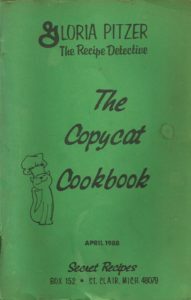 This book would also suit those singles who want to impress their dates with “home cooked” meals, but don’t want to deal with complicated recipes. 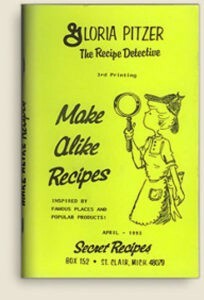 College students will also like the simple 1-2 serving recipes in this book. You can also customize the recipes to your needs by doubling, tripling or quadrupling ingredients for more servings. 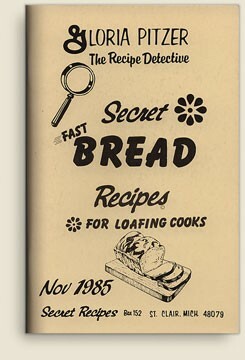 1985 – Secret Fast Bread Recipes was written, illustrated and published by Gloria Pitzer (Secret Recipes, St. Clair, MI). 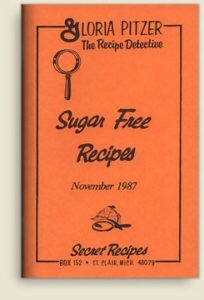 NO LONGER IN PRINT – this cookbook has a 120-page, 5.5″ x 8.5″ format with 347 recipes listed, covering muffins, biscuits, sourdough, Herman, coffeecakes, donuts, rye, whole wheat, pumpernickel, white bread and many more! 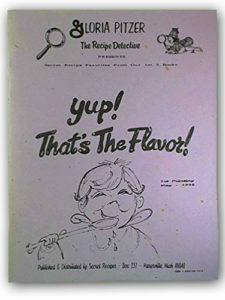 Many of the recipes in this cookbook need only a few ingredients. One recipe for yeast bread dough can be kneaded right in the bowl!